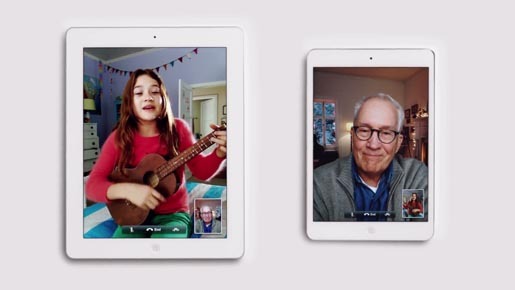 Apple has released “I’ll Be Home”, a television commercial for the iPad Mini featuring the song, “I’ll be home for Christmas” popularised in 1943 by Bing Crosby. A young girl appears on her grandfather’s iPad singing the song and playing on her ukelele. Her grandfather’s appreciative face is seen on her iPad mini. The Home for Christmas ad is part of a campaign developed at TBWA\Media Arts Lab, Los Angeles, and produced at Green Dot Films. I’ll be home for Christmas was written in 1943 by lyricist Kim Gannon and composer Walter Kent. Buck Ram, who wrote a poem and song with the same title, is also credited.